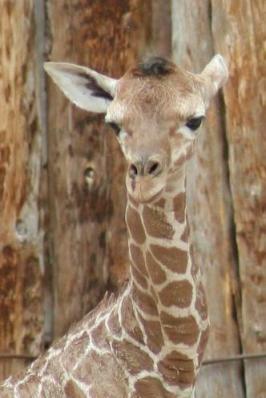 On Friday, April 26, 2013, keepers walked into the Zoo early in the morning to find Sarah with her healthy newborn! 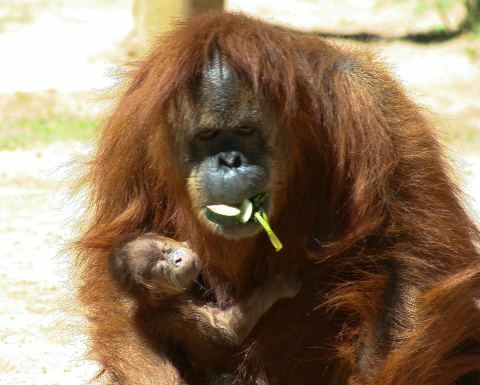 Sarah and her baby can be seen in the orangutan yard on warm, sunny days. Older sister Reese, father Tonka, and unrelated yard mates Rubi and Memala are all in the yard with mother and baby. (Reese can still be seen swinging and playing, but often goes to Sarah, seemingly curious about her little sibling.) Join us at the Zoo on Saturday, May 11 for an Orangutan Baby Shower and gender reveal party. Eat cake, vote for your favorite baby name, talk to orangutan zookeepers and enjoy other activities. During the BioPark&apos;s Earth Day celebration on April 20, Zoo visitors had the surprise chance to see June, an 18-year-old reticulated giraffe, give birth to a healthy female calf. The newborn was up and walking just 40 minutes after the 10:12 a.m. birth. The strong female calf was born at 120 pounds and is just shy of 6 feet tall. Keepers will pick a slate of names, and Facebook fans will vote for their favorite in coming weeks. The calf joins mother June, 2-year-old sister Amani, an unrelated female named Camilla, and the sire, 10-year-old Buccaneer. Because June did not bond with the calf, the newborn was not able to nurse, so animal care staff will hand raise her. Zookeepers will integrate the calf back into the female herd as soon as possible. In the meantime, she is learning how to drink from a bottle and can be seen often in the giraffe yard. Chopper moved to the ABQ BioPark Zoo on Nov. 14, 2012. He was born at Florida&apos;s White Oak Conservation Center on October 30 and weighed 132 pounds, but did not establish a strong bond with his mother. 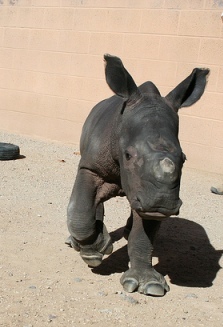 BioPark animal care staff moved the rhino from Florida to Albuquerque so he could be hand reared. Chopper drinks bottles of Creamland Dairy milk with extra dextrose and vitamins. This formula mimics the very sweet, low-fat milk of rhino mothers. The white rhino (Ceratotherium simum simum) is the third largest land animal, but nearly went extinct in the early 1900s due to poaching for horns. Conservation efforts, like captive breeding at zoos, have been an integral part of saving these animals from extinction. A baby Bactrian camel, was born on April 28, 2012. Kix, a young male, joined the Zoo&apos;s camel herd just in time for Mother&apos;s Day. Kix and mother Betty often snuggle together in the camel exhibit, which is near the elephants. When he&apos;s not resting, Kix can be seen kicking and jumping as he plays. He likes to run around his older sister, Kashi, who was born at the Zoo last year. Amazing adaptations help camels live in extreme desert environments. Fat is stored in their humps, which is converted to water and energy when sustenance is not available. Camels also have shaggy protective coats, long eyelashes, broad footpads and they can drink saltwater. While common in captivity, Bactrian camels are critically endangered in the wild. Fewer than 1,000 surviving wild camels remain. To ensure a future for Bactrian camels, the Association of Zoos and Aquariums (AZA) organized a Species Survival Program (SSP). The SSP works to sustain a healthy, genetically diverse and demographically varied AZA population. Kiran and Kalmali, the BioPark&apos;s snow leopard cubs, are brothers born on July 21, 2011. They are the fifth litter for Kachina and Azeo, the BioPark&apos;s two adults. Kachina is a fierce and protective mother and the cubs have thrived in her care. Now grown, Kiran and Kalmali have found homes at other zoos in North America. The ABQ BioPark welcomed Kachina&apos;s sixth litter: twins born on Friday, May 3, 2013. Kachina and her cubs are currently in their nesting box and off exhibit. The Zoo will announce when the family ventures back into their exhibit, which will likely occur when the cubs are a few months old. Snow leopards are endangered, and zoos and conservation organizations around the world are helping to protect them through a Species Survival Plan (SSP). Organized by the Association of Zoos and Aquariums, the SSP helps arrange adult pairs to maintain genetic diversity. Lynn Tupa, ABQ BioPark Zoo Manager, helps to coordinate the snow leopard SSP. Kachina and Azeo are highly compatible. Under the expert care of BioPark staff, Kachina and Azeo are breeding and raising young with unparalleled success. The cats have produced a litter each year for five years and have eight offspring throughout North American zoos, making the BioPark a leader in snow leopard conservation. Daizy was born on September 2, 2009, weighing 318 pounds. Now she is 2 years old and weighs more than 2,100 pounds. Her mother, Rozie, was the the first elephant born at the ABQ BioPark in 1992. Asian elephants are considered endangered and several conservation efforts around the world are working to increase their populations. The Zoo is part of Association of Zoos and Aquariums’ Elephant Species Survival Plan. Reese was born on October 2, 2008. She is very independent now and can often be seen climbing all over the Apes exhibit. Orangutans face serious threats from deforestation and habitat loss. The species is critically endangered.